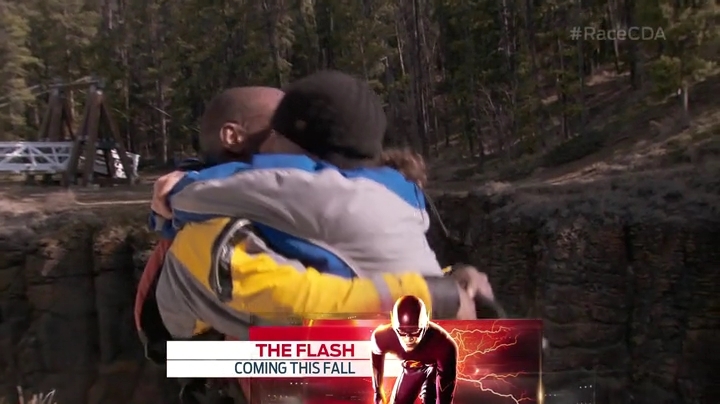 Recap: The Amazing Race Canada 2, Episode 5 – "Make him go more 'haw'." Teams get started on the 5th Leg of the Race and find out they are returning to Canada, this time flying to the Yukon. 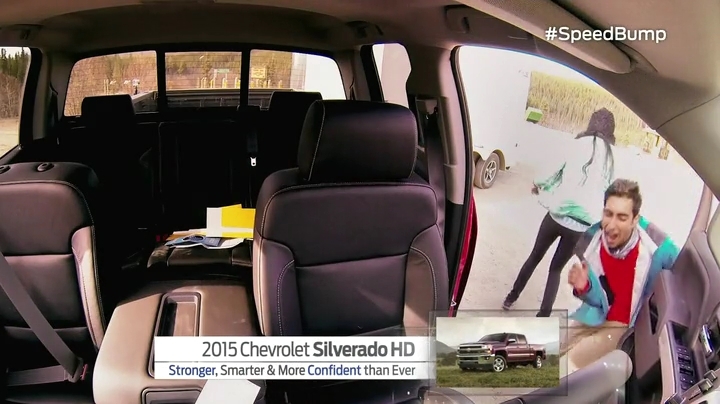 Once there, teams will drive brand new Chevrolet Silverado Heavy Duties to Sky High Ranch. Teams are also given one Loonie onto their Scotiabank Gold American Express Card. This is the Leg Natalie & Meaghan need to hand over the Express Pass. They decide to give it to Pierre & Michel, but with some conditions. They won’t U-Turn each other, but they hope Pierre & Michel can help them out and U-Turn someone who might be on their butts in the future. 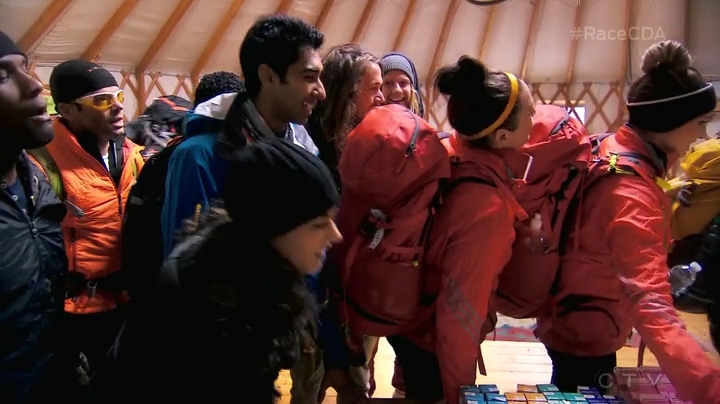 The other teams are surprised to see Sukhi & Jinder are still in the Race, but they are more SHOCKED that Natalie & Meaghan would give Pierre & Michel, who they think are nasty people, the Express Pass. After everyone freaks out, they hop onboard Air Canada and enjoy their new Premium Economy seats across the Pacific to Whitehorse, Yukon Territory. Upon arrival, teams drive themselves to Sky High Ranch where they will spend the night. In the morning, the breakfast bell rings and teams grab some food before receiving their next clue, the Detour. For this Detour, teams will get to experience two Yukon survival skills. In Ride a Sled, teams will choose a group of three dogs then run down the trail 1.5 km to Fish Lake and search through a pile of dog harnesses belonging to the dogs they have chosen. Once they’ve correctly harnessed the dogs onto a sled, each team member must take a turn on the sled for three laps. In Make Your Bed, teams will recreate a campsite and then build a fire to gain access to a key frozen inside a block of ice. Once they’ve paid attention to detail and use the key to open a box of provisions, they will receive their next clue. Sukhi & Jinder, Natalie & Meaghan, Ryan & Rob, Pierre & Michel and Alain & Audrey choose Ride a Sled. Mickey & Pete, Nicole & Cormac and Rex & Bob choose Make Your Bed. Sukhi & Jinder, Ryan & Rob and Alain & Audrey find their correct harnesses, but Natalie & Meaghan and Pierre & Michel forget the names of their third dogs. So the two athlete teams have to run back to the start. Natalie & Meaghan run back to the lake while Pierre & Michel decide to switch over to the campsite and they work very fast to catch up to the others who had started earlier. At the lake, Sukhi & Jinder are lost again and go over to Ryan & Rob to see how they’ve managed to fit the harnesses onto the dogs. Ryan & Rob tell the siblings to go look at the example as they really don’t want to help. Sukhi & Jinder see what they’re doing wrong and head back to their own dogs. Audrey, meanwhile, also has no idea and then she loses one dog as it runs away. Ryan & Rob get out on the course first, followed by Sukhi & Jinder and then Natalie & Meaghan. Alain & Audrey’s dogs though don’t want to even get started. Ryan & Rob stay in first place and they get the clue telling them to drive up to Grey Mountain. Mickey & Pete over at the campsite finish next. 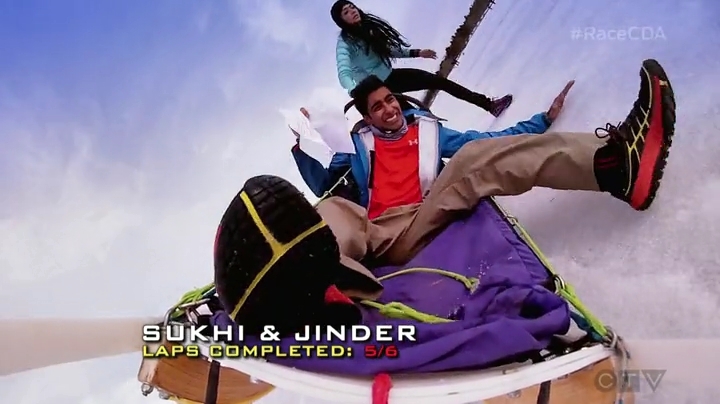 Sukhi & Jinder are in 3rd, but now have to find their Speed Bump back up near the office. 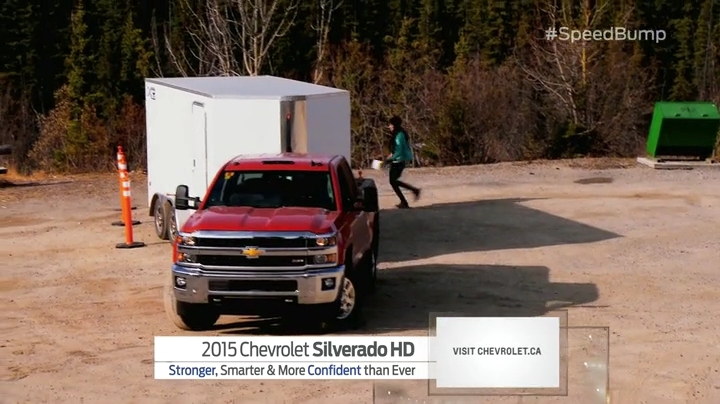 For their Speed Bump, Sukhi & Jinder will use their awesome Chevy Silverado to tow a 20 foot trailer 12.5 km and park it in reverse in a designated spot without knocking over any cones. Natalie & Meghan, Cormac & Nicole and Pierre & Michel finish the Detour, leaving Alain & Audrey and Rex & Bob doing their respective Detours. While Sukhi & Jinder get through their Speed Bump, Alain & Audrey finish their Detour and manage to catch up to Natalie & Meaghan. Meanwhile, Ryan & Rob get to Grey Mountain and find the Road Block. For this Road Block, teams will participate in a Biathlon course. First, they will ride a fat tire snowbike on a grueling 1 km loop in the woods. They will return to the firing range and get five rounds of ammunition to hit five targets 50 meters away. If they do not hit all targets, they must ride another loop in the woods to get another five rounds of ammunition to shoot out the remaining targets. Ryan decides to do the Road Block as Rex & Bob finally finish the Detour. Ryan gets back to the firing range, but only hits two targets. Outside, Natalie & Meghan, Alain & Audrey and Cormac & Nicole arrive. Natalie, Alain and Nicole do the Road Block. Mickey & Pete and Pierre & Michel are lost. Natalie gets four targets on her first try and Nicole gets none. Alain, on the other hand, gets all five targets and he and Audrey head to the Red Trail on Chadburn Lake Road for their next clue. 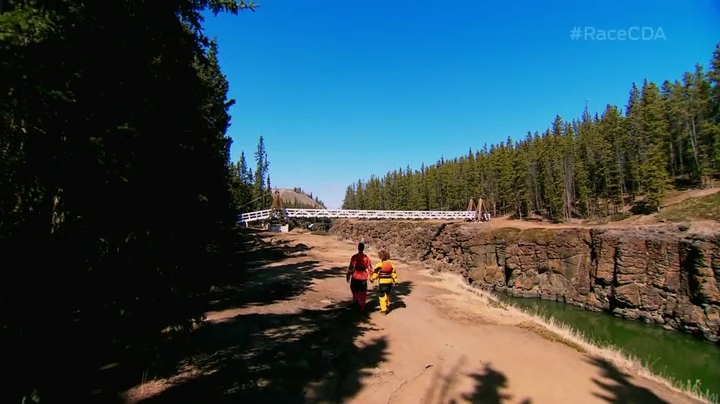 Mickey & Pete and Sukhi & Jinder arrive at the Road Block as Natalie & Meghan leave. Ryan & Rob are not too far behind. Alain & Audrey arrive at the Route Marker and find the next clue inside canoes. Teams must now portage their canoe down a marked path to the Yukon River. The must then paddle 1.5 km to the Pit Stop on the edge of Miles Canyon. Pete thinks this Road Block should be easy, he’s been hunting since he was a kid. 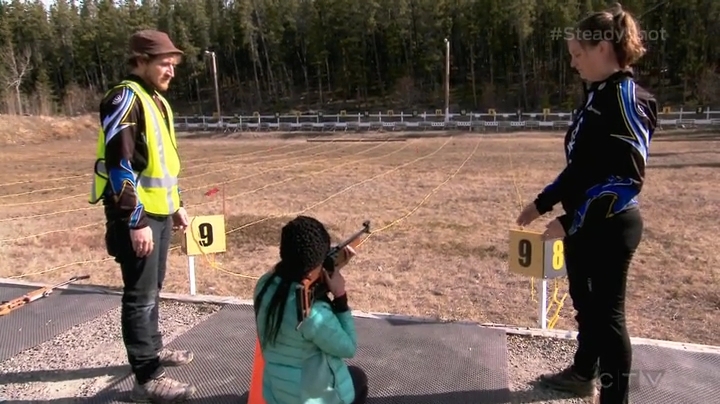 Rex & Bob and Pierre & Michel arrive at the Road Block together as Sukhi goes for her first attempt at the targets. 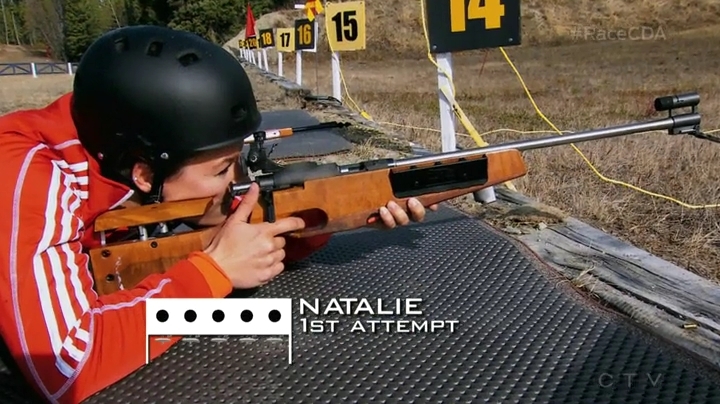 She doesn’t even know how to hold the rifle, but she gets four of the targets on her first try. The others can’t believe it. Even more when Sukhi gets the last target on her next try and she and Jinder are out of the Road Block in 4th. Alain & Audrey get to the river as Ryan & Rob and Natalie & Meaghan get started with portage-ing. 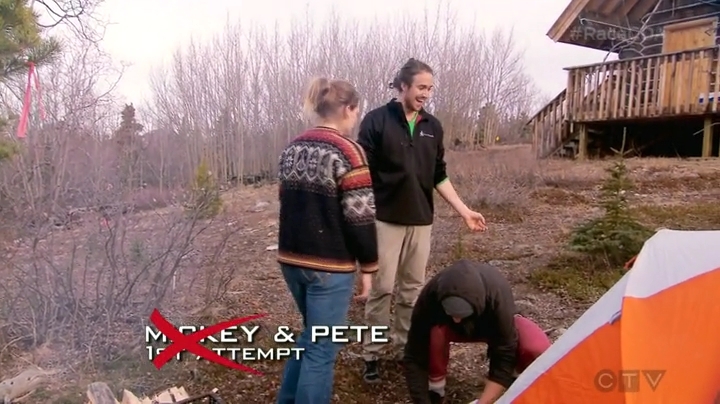 The guys make it their mission to pass Natalie & Meaghan who are having a hard time with the canoe. Alain & Audrey find Jon and they step on the Mat as Team #1. They win a trip to any of the “sun” destinations Air Canada Rouge flies to as well as $3000. Ryan & Rob take 2nd with Natalie & Meaghan finishing 3rd. Back at the Road Block, Pierre finishes and he and Michel leave. Pete finally gets three targets, but Nicole is up to 10 attempts and she hasn’t even hit one target. Rex gets all his targets on his 5th attempt. 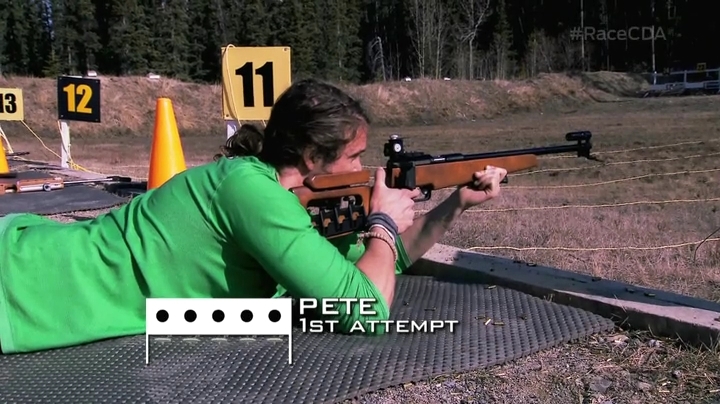 Pete gets it on his 8th attempt. That leaves Nicole & Cormac alone at the Road Block. Nicole finally gets her first target on her 13th attempt. At the canoe, Sukhi & Jinder are not sure where downriver is. They are actually going upriver, but they correct themselves and step on the Mat in 4th. Pierre & Michel take 5th. Mickey & Pete pass Rex & Bob and arrive at the Mat as Team #6. Rex & Bob finish 7th. Nicole is exhausted, but she is not going to give up. On her 21st attempt, she gets two more. And on the 22nd attempt, she finally finishes. They run to the Pit Stop, but Jon gives them the bad news. They are eliminated from the Race. Now THIS was an amazing episode. Definitely the best of the season so far. The competition was excellent. The tasks were simple on paper yet challenging enough to promote great competition. So many placement fluctuations; that is what you want to see on the Race. And of course, that meant Natalie & Meaghan’s streak is over. They’re great, but it’s also good to see teams moving up. The editing though on this episode was on point. From the hilarious dogs to Rex & Bob’s breathing in the tent and then echoing in the canyon to the reactions shots to the comedy. SOOOO good, I though. 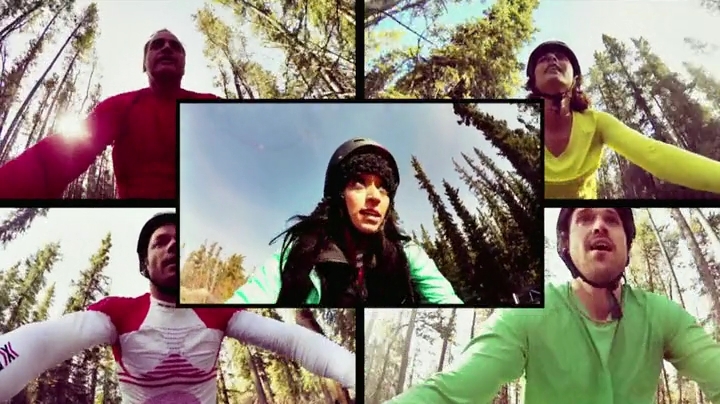 And is this The Amazing Race Canada or am I watching TAR Asia? Foreign languages! French, now Hindi? It is definitely awesome. I was apprehensive about the Race heading back to Canada after Hong Kong and Macau, but the Leg was just so good and the episode just amazing. I was actually prepared to be a little disappointed after TARAu’s great premiere last night, but looks like TAR Canada is not going to get topped by its big brother across the Pacific. Sukhi & Jinder are amazing. They are definitely my favorite team. So hilarious, yet so awesome. Especially Sukhi being clutch at the Road Block. How great was that to see them again acting desperate, then having to complete the Speed Bump, but then rocking the Road Block. Love them. It was great to see Alain & Audrey stepping it up this Leg even if they were still their hilarious French-speaking selves. It was also great to see Natalie & Meaghan remind us that they are still human. They are definitely still a strong, VERY strong team, but it’s good to see they are not absolutely perfect. Mickey & Pete are great too. Stumbled at the Road Block, but still a fun team who definitely have a chance to go far. I hope Pierre & Michel continue to settle into that villain role. They are also fun to watch. 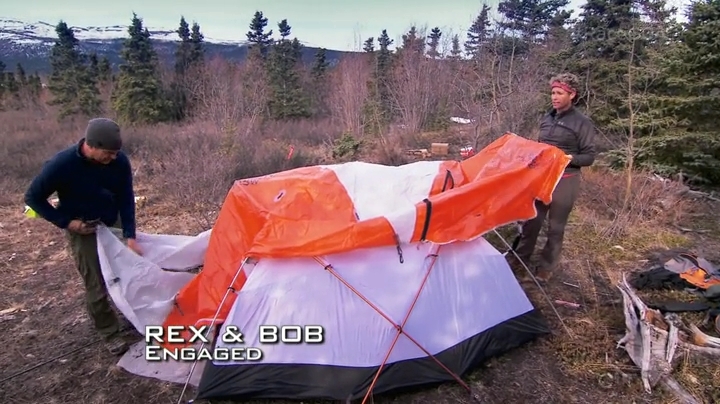 Rex & Bob were back to their own fun ways as well and while they are not Racing as well as they’ve shown they can, at least they make their Race fun watch to wach. Definitely a sad way for Cormac & Nicole to go. Much kudos to her for pushing through that frustration. I think they definitely could’ve gone much further. But that’s the way the Race works. Ryan & Rob are not bad, but still pretty blah, especially when everyone else is so fun and interesting.